Experience the magic of a day at Puffing Billy Railway. 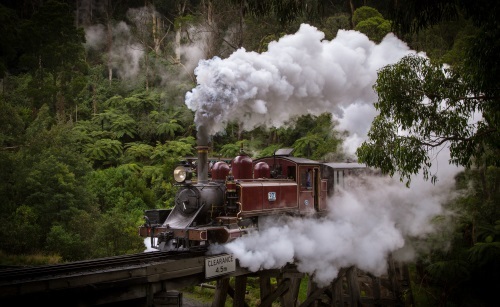 This winter, we invite you to meet some of the characters of the railway, have your photo taken with the driver, take in the majestic scenery of the Dandenong Ranges, feel the excitement as you cross historical timber trestle bridges, and delight in the sound of the whistle echoing through the hills. Start your journey at Lakeside Station, located in the beautiful Emerald Lake Park. Arrive early and get yourself a warm drink from our Lakeside Teamroom to enjoy as you spend some time exploring the park. Stroll along one of the many signed walking paths around the lake as you take in the beauty of the surrounds. Make your way to the platform before boarding the train to Gembrook for your relaxing trip on board a historic steam train. Enjoy stunning views of the Wright forest and rich open farmlands as you travel over THREE trestle bridges (including the tallest bridge on the line!) to the scenic country town of Gembrook. Kids will love spotting the farm animals and waving to every passer-by along the way. Arrive in Gembrook to an array of cafes and restaurants at which to eat lunch, or pack a picnic to enjoy in JAC Russell Park right next to the platform – there are even free BBQ facilities! After lunch, why not take a stroll along the new rail trail, explore the boutique stores, or grab a treat for the ride back home. Remember to bring your camera as you create lifelong memories onboard Australia’s favourite steam train, Puffing Billy.